If you’d like to reserve the Bailey Center for an event, contact Linda Martin at 683-7208 or by email at lbmartin@ualr.edu. You will also need to complete an event request at schedule.ualr.edu. 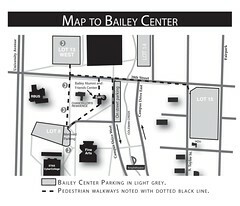 Download the Bailey Center room rates. The Bailey Center contains more than8,200 square feet. 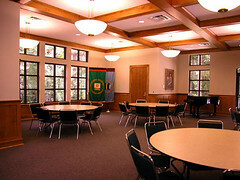 The following spaces are available for rent to campus and community groups for meetings, programs, and social functions. 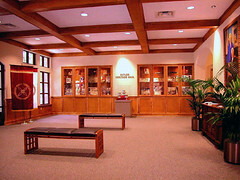 As you enter the center, the Butler Hall greets you with large display cases containing memorabilia and artifacts, providing an interesting backdrop for any reception. The formal boardroom contains a cherry table that will accommodate approximately 22 people. 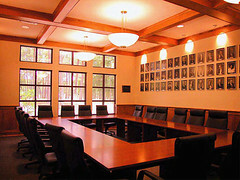 Black leather chairs and granite countertops make this room stately yet comfortable for meetings and seminars. With its high wooden-beamed ceilings and panoramic view of the campus, the hall can accommodate a seated dinner for 60 people or a reception for 150. The baby grand piano gives you a convenient option for background music at your event. Our large patio is the ideal place for a barbeque cookout, a casual gathering of close friends, or a reception before an award ceremony begins. Effective August 1, 2010 UA Little Rock is a smoke-free campus. In compliance with the Clean Air on Campus Act of 2009 passed by the Arkansas General Assembly, this policy applies to all locations of the University. These areas include the main campus, University Plaza, the William H. Bowen School of Law, and the UA Little Rock Benton Center. Perosns who fail to comply are subject to disciplinary action. For more information, call 569-3188 or go to ualr.edu/smokefree.